Synbiont Kennel Wash | Helps to clean away deadly viruses like canine parvovirus, as well as harmful pathogens. Synbiont Kennel Wash helps to clean your animals and the environments they live, work and play in. Remove inanimant contaminants that can be easily transferred from the dog park, footpaths, shows and trials to your animal and their surroundings. 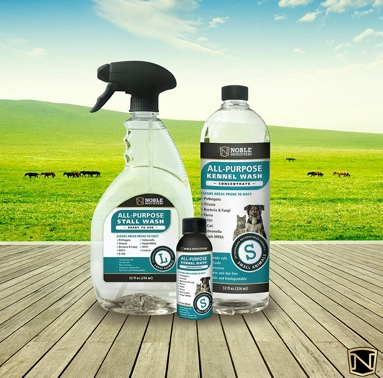 Click here to check out our new private label line of products with Noble Outfitters! Synbiont Kennel Wash helps to clean away deadly viruses like canine parvovirus, as well as harmful pathogens that can be easily transferred from the dog park, footpaths, shows and trials to your animal and their surroundings. Buy Synbiont Kennel Wash online in multiple sizes - add other products from the Synbiont range in just a couple of clicks. Read what people are saying about Synbiont Kennel Wash and other Synbiont products.